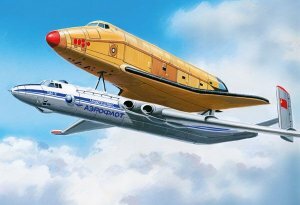 The official decree of making a reusable space transport system is published on February 17th, 1976 by the central committee of the Communist party of the USSR. Some times later (on November 21st, 1977) the Ministry of General Machine-building (MOM), Ministry responsible for spatial projects and for missiles, emits a decree for the construction of a transport system of the elements of the rocket and the shuttle to the launch pad. The transportation by road or by boat was impossible not because of their size or for confidentiality reasons, but rather because the cargo would have been subjected to prolonged vibrations during the journey. 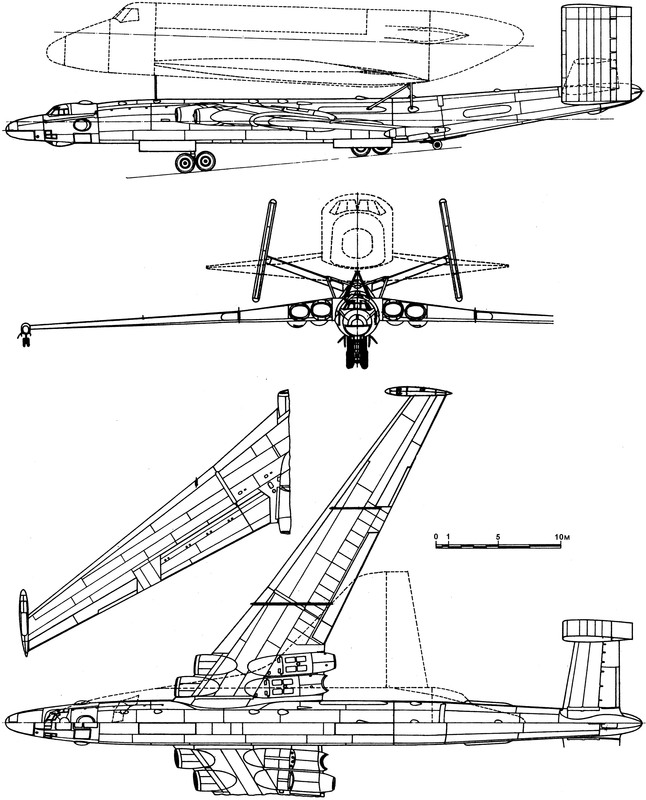 MAP tasked the OKB-473 design office (Antonov) to design this plane. 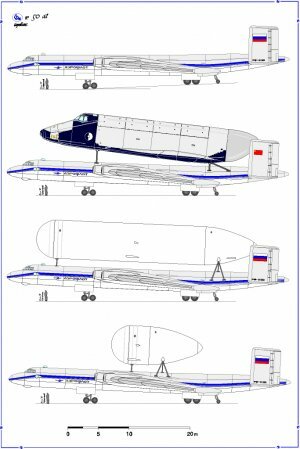 By then the work on the AN-124 'Ruslan' was well advanced, so Antonov took the decision to build this new plane (AN-225) based on the design of the AN-124. 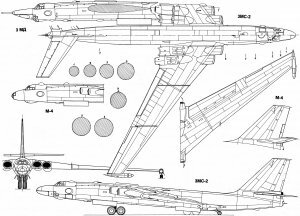 Unfortunately much time was wasted in discussions with Antonov and the prototypes of the Energia LV and Buran were nearing completion in the mean time. 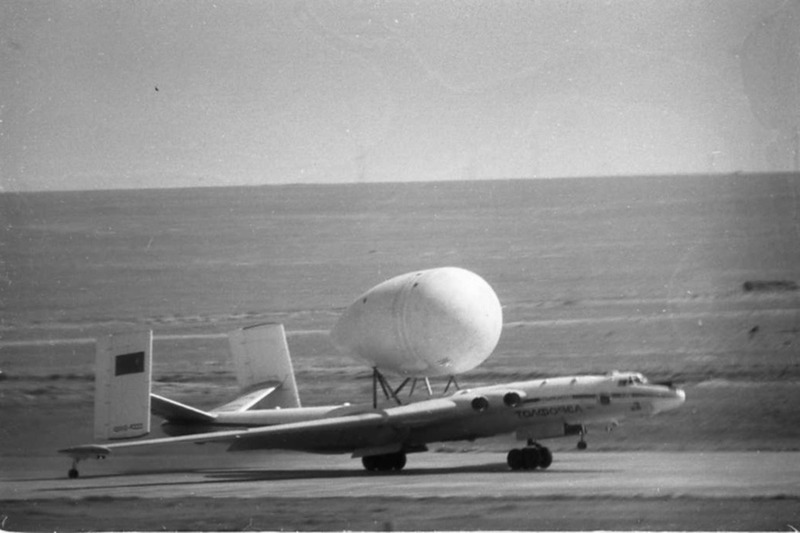 Seeing that the Antonov design office had still troubles with developing its plane the Myasishchev design office suggested to modify the bomber 3M to carry those loads and renamed it 3M-T (T for Transport). Other design offices suggested solutions but they were soon dropped, using an IL-76 Candid, or two helicopters Mil-Mi 26 (the carriage of the tanks proved to be too hazardous). 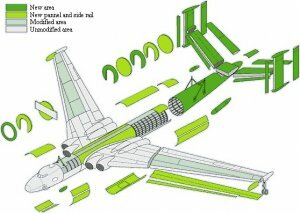 The transformation project consisted of using 3MD model (bomber with refueling probe) by changing the rear part of the fuselage. Indeed, the transport of a load like the Shuttle or Energia's tanks makes a lot of turbulences at the rear of the plane, they should replace the single vertical stabilizer by a twin tail. Many tests in wind tunnels were performed and proved this design to be reliable. Indeed the carriage of a payload on the back of a plane is not a normal configuration for these kind of machine, so an enormous work of collaboration with the engineers of TsAGI (wind tunnels) had to be done to get rid of the irregularities and to find different anchors points, even if they were not agree to work on it at the first place. Boris I. Zorin was appointed chief project engineer, after its death V.A. Korchagin became the 3M-T's project chief assisted by project engineer V.M. Kirillin. The Myasishchev OKB's involvment in the multipurpose rocket space transport system programme as a 'subcontractor' stretched its resources to the limit, requiring a substantial reinforcement of the design staff. Several experienced engineers were hired, along with numerous graduateds of MAI and the Kuibyshev Aviation Institut. Moreover the tests installations at Zhukovskiy had to be thoroughly reorganised and re-equipped with the latest hardware with the collaboration of the MOM and the Ministry of Aviation Industry (MAP). In fact the 3M-T undergo so many modifications that it's not a simple evolution of the 3M but a new plane. 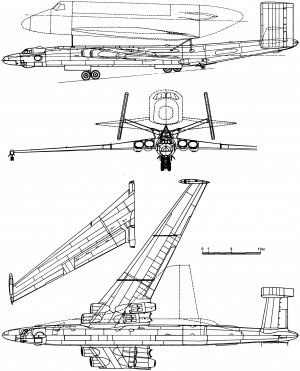 Like their colleagues of Antonov they developed a new double twin tail, but it generated much higher structuration loads that the entire rear had to be reinforced. The tail unit area amounted to 26% of the wing area, making it any smaller was impossible because of the powerful vortices generated by the bulky external load. The new rear fuselage was 7m longer and was upswept to provide adequate ground clearance, the paylod bay was sealed and reinforced to absorb vibrations and of course the dorsal and ventral cannon barbettes were also deleted. The nose and main landing gear units were stock 3M items, but the wingtips outrigger struts had to be reinforced because of the greater loads absorbed in the event of a banked landing in a crosswind. The flight control system was all new, featuring an automatic stability enhancement system. Irreversible hydraulic actuators were used in all three control circuits instead of reversible ones. The fuel system was modified, allowing fuel to be transfered in order to change the center of gravity according to the freight. The aircraft was re-engined with more powerful Dobrynin VD-7MD non-afterburning turbojets rated at 10,750 kgp for take off. The cargo was secured by a system of struts forming three-dimensional trusses located in pairs on the forward and rear fuselage. Each strut was adjustable lengthwise and featured joints at both ends to alleviate bending loads. Finally, the crew was reduced to six, tail and dorsal gunners being useless. Initially the design office Myasishchev should have transformed three working planes. But which one? 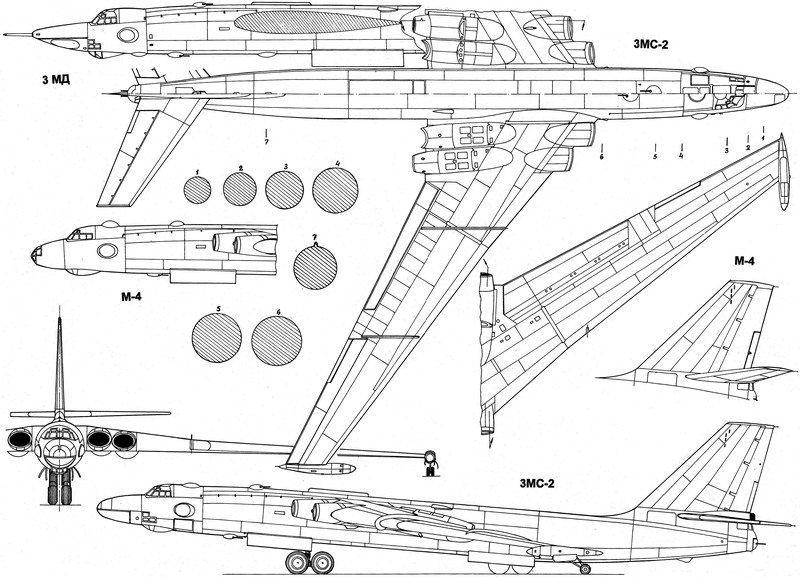 After harsh discussions between Reshetnikov, Kuznetsov and representatives of OKB Myasishchev, three planes 3MN-2, tank planes (serial number: 9301402, 9301502, 9301504), were turned over to be transformed and working in 1979. The work began in 1978 with cooperation effort of MAP, MOM, the Moscow Machine Plant, the 'Strela', the Kuibyshev aircraft factory, the Tashkent Aircraft Production Association. After the death of Vladimir Miassichtchev on October 14, 1978, the 3M-T was renamed VM-T Atlant in his honor. VM for Vladimir Miassichtchev and Atlant (Atlas Greek god) as a reference of its impressive lifting capacity. The final assembly procedeed at Zhukovskiy, the huge amount of work was done really quickly and allowed the plane to fly only after 18 month after the start of the work (the plane wasn't totally modified). 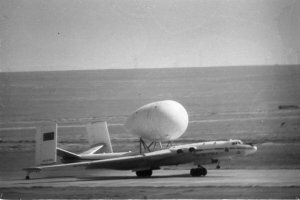 Finally on April 29, 1981 the VM-T Atlant flew for the first time (without payload) with crew: captain Anatoliy P. Kucherenkov, co-pilot N.N. Gheneralov, navigator S. Sokolov, co-navigator I. Semookhin, flight engineer B. Ayzatoolin, radio operator V. Padookov. 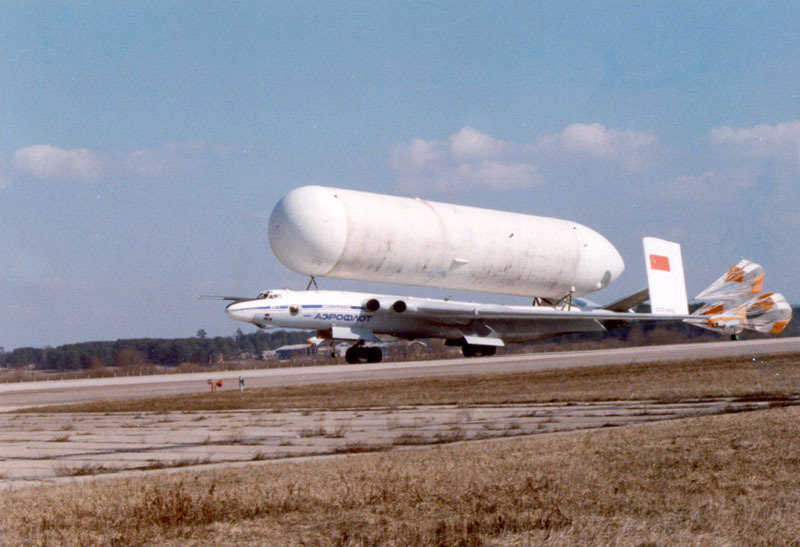 The first flight with a payload took place on January 6, 1982 (flight with an Energia's tank 1GT). The first flight with a Buran shuttle occurred on Mars 1st, 1983. The shuttle weighted 45.3 t. The vertical stabilizer, and many instruments were removed to lighter it for not weighting more than 50 t. The 1K Buran arrived at Baikonur on Mars 23, 1988 carried by a VM-T 0GT. But at 300 km from the cosmodrome a fuel leak forced the crew to shutdown the engine 2 to decreased fire possibilities. Soon before arriving at the airport Yubileynyy (Baikonur's cosmodrome airport) the generator circuits failed one by one leaving only the DC batteries as only electrical power source. Fortunatly, the landing gears were already deployed but the flaps were not and couldn't be extended. Finally, the engine 1 also flamed and should be shutdown. The situation was truly catastrophic the plane came in to land at the speed of a fighter. Luckily, the pilot P. Kucherenko and Eduard N. Chel'tsov managed to land it smoothly. The VM-T atlant flew more than 150 times to Baikonur to deliver different kind of pieces for the Buran-Energia program. The flight of Energia-Ployus in 1987 and the one of Energia-Buran in 1988 couldn't have been taken place without these old bomber planes from the 60s. During this time Antonov finished the development and the tests on the Mriya (AN-225), but it was too late, Buran 1k already flew. 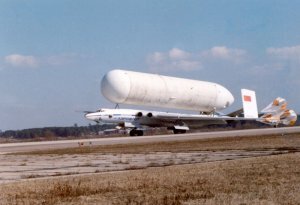 The AN-225 chief project engineer, A.G.Vovnyanko, even discredit the VM-T by saying this: "Another aircraft used for this kind of transport operations was an upgraded 201M (this is how the 3M bomber was called by the Soviet popular press in the days when military censorship was really strict - Auth). It delivered large components of spacecraft to Baikonur; yet this was the best amateur could do in this field.". 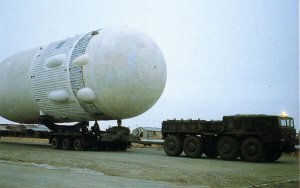 In 1992 the Myasishchev OKB began development of the Demonstrator multi-stage space-launch system based on a VM-T as a joint effort with TsAGI and the manufacturer NPO Saturn. The aircraft was to carry a sub-orbital launch vehicle powered by two D-57 cryogenic fuel rocket motors. 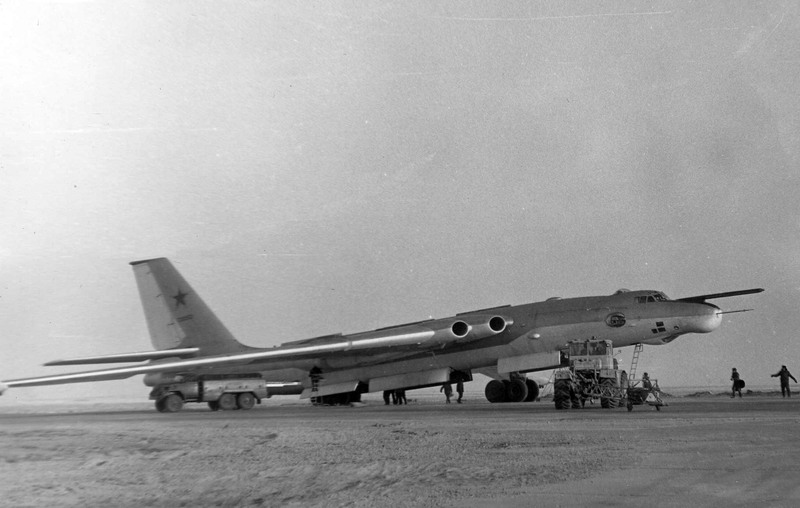 Others projects were to use the VM-T as a launch platform for an hypersonic drone or as an engine testbed. The VM-T hasn't been reused since the end of the 80s and the conversion projects of the beginning of the 90s lead to nothing. News of the VM-T Atlant on the blog.